With respect to nanopore functionalization we are developing strategies allowing the design of (nano)locally functionalized nanopores, functional gradients, and multifunctional nanopores. Advanced transport control in nanopores beyond gating in the first place requires functionalization control. This holds for gradual control of nanopore accessiblity, gradient design as well as for multifunctionality in nanopores. Therfore, we explored different polymerization strategies to control polymer amount and polymer location in nanoporous films. A. Andrieu-Brunsen*, S. Micoureau, M. Tagliazucchi, I. Szleifer, O. Azzaroni, G. J. A. A. Soler-Illia*, Mesoporous Hybrid Thin Film Membranes with PMETAC@Silica Architectures: Controlling Ionic Gating Through the Tuning of Polyelectrolyte Density, Chem. Mater., 2015, 27, 808. L. Silies, H. Didzoleit, C. Hess, B. Stühn, A. Andrieu-Brunsen, Mesoporous Thin Films, Zwitterionic Monomers, and Iniferter-Initiated Polymerization: Polymerization in a Confined Space, Chem. Mater., 2015, 27, 1971. Especially in the context of sensing, monitoring and the design of selective or coupled transport phenomena, multifunctional nanopores will be needed. 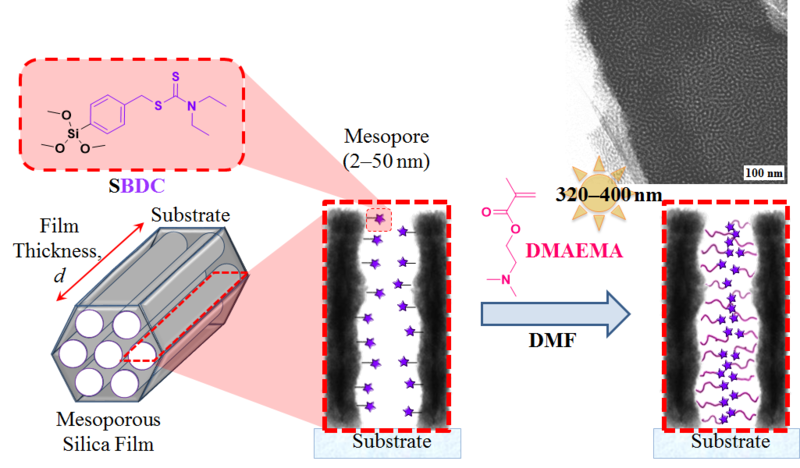 Currently we are working on different strategies using interface effects such as wetting and the combination of differnet materials or looking at re-initiation of polymers and block-co-oligomer formation to place multiple functions into individual nanopores. Compartmentalization and miniaturization of device components is essential e.g. to build multifunctional small lab-on-chip devices. Transport direction will need functional (nano)gradients along nanopores. Localized detection will need (nano) local readout. We are exploring the potential of near field modes to localize polymer functionalization in three dimensions at the nanoscale. Due to the wavelength region of these near field modes such as surface plasmons this needs visible light (> 470 nm) induced polymerizations. Currently, we are for example investigating dye-sensitized polymerization using methylene blue or fluoresceine. N. Herzog, J. Kind, C. Hess and A. Andrieu-Brunsen, “Surface plasmon & visible light for polymer functionalization of mesopores and manipulation of ionic permselectivity”, Chem. Commun., 2015, 51, 11697-11700.